A traditional wok is simply a round, versatile pan used above the flame burner. Invented during the Han dynasty in China, it was basically designed to dry out tea leaves, vegetables, and meats. Over the centuries, it has been used for several purposes. But the basic structure of wok has always remained the same. Now, the wok has been used for stir frying which needs adding oil to a hot pan and cooking food instantly and searing flavors of sauces and oil to all ingredients. Dishes get a unique flavor when cooked in a wok, which is known as the ‘breath of the wok’ by Chinese. You can now cook your food with the same authentic Asian flavors with the best electric woks. These cooking tools are designed to get hot quicker than traditional stove top models. These cooking tools are handy with easy to clean nonstick surfaces. So, you can easily slide your culinary dishes on the serving dish without adding extra butter or oil. 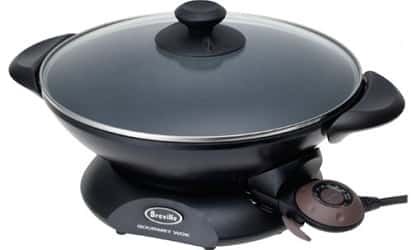 In small homes or dormitories where space is very limited, you can have electric woks which are very versatile cookware. They can be used to make deep-fried dishes, stir fries, and soups. They really serve the purpose of a hot plate, yet only need one pan to create different dishes. It makes cleanup really easy and it needs less time and water to wash dishes. Electric woks heat up faster, set up easily, and make it easier to get all the pros of healthy Asian dishes. Presto 5900 1500 Watt stainless steel electric wok is your easy and quick way to prepare smoking hot stir-fry meals. 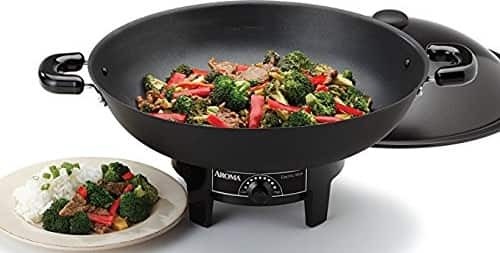 Make your healthy stir-fry meals within minutes for you and your family with this electric wok. It sears ingredients in less oil and fat and preserves nutrients with fresh flavors, colors and textures. Aroma Housewares AEW-305 is a sleek electric metal wok designed to heat up faster and maintain its heat as you cook. It locks in the flavor of foods for best results every time. It gives great versatility with complete range of temperature controls. The domed lid and inside of wok are coated non-stick to make cleanup and operation easier. Along with just for stir-fry, it is also ideal for steaming, braising, and tempura. Now you can make your traditional and modern Asian dishes with ease. Just like cooking on gas stove, this amazing hot wok from Breville provides even heat distribution across the corners of wok. It improves its ability to sear in high heat. Its aluminum layers are heat responsive to maintain high heat for searing in moisture and food. It provides emulate 425F authentic Asian cooking style with 15 accurate heat settings. You can now enjoy at Hotspot or Shabu Shabu while grilling seafood like shrimp and other meat at the top with Sonya Electric Hotpot and BBQ grill. It can make cooking while eating comes true. You can enjoy all kinds of dishes and serve your family and friends. You just have to put all the ingredients in this pot or on the grill plate. It is ideal for family get together or having fun with friends. It comes with BBQ grill so you can enjoy hot pot and shabu shabu at the same time. 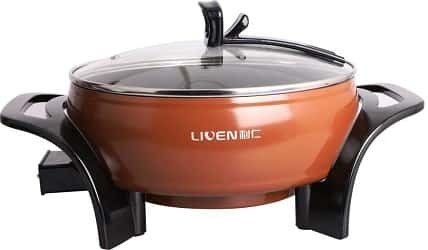 It has removable grill pan and cooking pots for easy to clean up and use. This electric multipurpose pot from Starfit is the best companion for your next party as it can keep your food ready to eat and warm all the time. 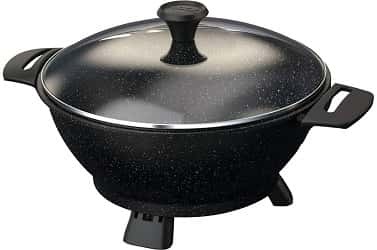 It is also amazing as a wok for different types of foods like stews, soups, chilis, sauces, and sautés. It has got the amazing Rock Tec surface treatment for non-stick surface which is 3x better than typical non-stick cookware. So, you can easily enjoy it with your friends and family without cleaning woes. Cook your loved stir-fry meals easily and instantly with this electric wok by Supernon. The Presto stainless steel wok cooks different types of Asian entries like meat, noodles, and dumplings. 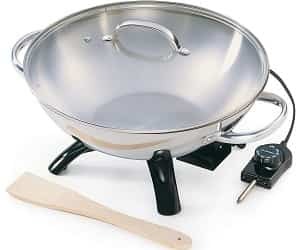 This electric wok has appealing stainless steel handles and body, along with stainless steel handle and rim. It has aluminum base to provide even heating with 1500W heating element for high searing temperatures for stir-frying. This stainless steel wok sears ingredients quickly in less oil to preserve fresh colors, nutrients, textures and flavors. It has Control Master Heat control system to maintain cooking temperature in itself. It is designed to save your cooking time and is also easy to clean. Presto Stainless steel electric wok is dishwasher safe and fully immersible. Breville EW30XL electric gourmet wok has truly upgraded the electric wok design in each aspect. 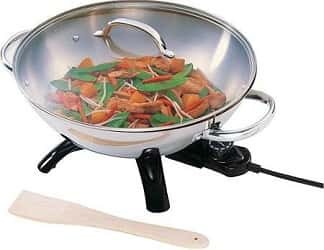 Now you can whip up delicious and healthy stir-fry meals with this handy and dashing electric wok. It has 15 settings for variable heat control, including high sear. You can control cooking time and temperature with precision. It has 1500W butterfly element which is recessed across the base to form heat zone over the whole surface. It makes great conditions for stir-frying and quick searing. Aroma Housewares AEW-305 electric wok heats up faster and retains high temperature for best results. It is easy to use, compact, lightweight and easy to store. It has complete range of temperature controls so it can be very versatile to use. It heats up oil at rapid speed. Choose high temperature range for stir-fries or low to serve up. It packs enough space with 7-quart capacity to serve ingredients for up to 5 people or more. It holds dishes with great chunks. It has vast cooking surface and large sides to whip up one-pot or family sized meals. VonShef presents electric aluminum wok for your kitchen to fry, sear, and sizzle your way to a vast range of finger-licking Asian cuisines. Different flavors need different temperatures. This electric wok comes with a rotary dial for precise temperature settings for complete control on your cooking. This pot is large enough to cook food for 2 to 4 persons in your family. 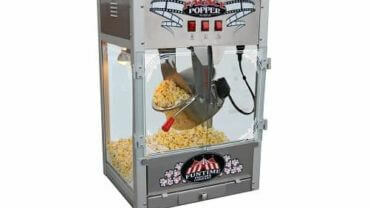 Push the power button to start and push fire power button to choose heat level – small, middle, big. You can easily operate it. There are more than a 100+ electric woks available on the market right now with different or same features. Most of you who have been on the market looking for the market would already know that it is not that easy to pick the best product from the long diverse list. However, to help you select and purchase the best product, considering the below listed factors is important. 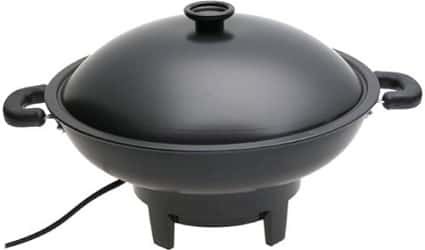 Capacity – Different electric wok models might come with different capacity and the capacity of the electric wok is what decides how much food you could cook in it. Most of the people who consider purchasing an electric wok commonly neglect the factor capacity and end up purchasing big electric woks. 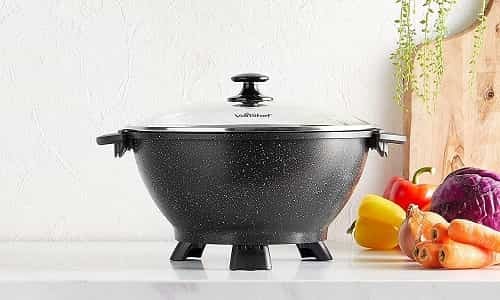 However, remember unlike normal stovetop wok, purchasing an electric wok with high capacity means, the high power usage and if you actually do not need such a high capacity wok then it would be a total waste. Therefore, before purchasing an electric wok, calculate the capacity that you would require and then purchase it. Coating – A wok is best efficient and useful if it comes with some type of coating on its interior. Most of the electric woks on the market come with a non-stick coating on it, which makes it easy for users to cook with ease. Now, just having the non-stick coating is not just fine, you should check the product specification and make sure that the non-stick coating on your electric wok is of high quality and does not emit any harmful chemicals. How soon can the wok heat – The efficiency of a wok, no matter what the type is, depends entirely on how soon the wok could heat and the heat conductivity of the wok depends on the heating element and the material with which the wok is made. If you are a person who needs the food to be heated fast then, we recommend that you consider purchasing an electric wok made of high heat conducting material. 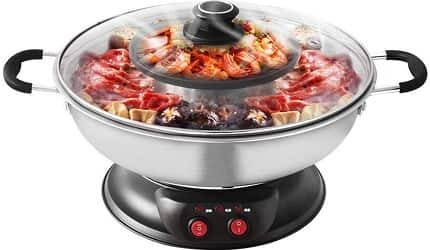 Power consumption – The power consumption of an electric wok spends on various factors, however, to an extent the advancement of technology has been able to limit the power usage to a minimum. Nevertheless, remember, as the capacity of the electric wok increases the power consumption increases and in the same way, as the speed of heating increases the power consumption also increases. This is why we recommend that you purchase an electric wok with a capacity that could meet your demand and before purchasing shortlist a few products compare them and then finalize. Variable temperature – An electric wok with no variable temperature feature is not something we recommend, yes there are products that lacks this feature. The best electric wok is the one with the variable temperature feature that allows the user to control the temperature at which the wok heats. Cleaning a wok after each use is very important if you prefer keeping the wok healthy, there are also specific methods that could help extend the lifespan of an electric wok with ease. Here is how to do it. Step 2: Once the wok cools down, with some luke warm water wash the wok and then rinse the wok. Step 3: Now, after cleaning the wok, with a dry cloth dry the entire product. On the other hand, if your wok is not non-stick, then after every three or four cycles of use and cleaning, the wok should be seasoned thoroughly. The seasoning will help you keep the wok away from rusting and corrosion. The buying guide mentioned above can help you ease the challenges in selecting the best electric wok on the market right now. Remember just purchasing the wok is not enough cleaning is very important too, the cleaning guide could help you maintain the wok in a healthy way. Are you planning for lawn picnic, beach party or just a balcony dinner, you definitely need the best electric wok. Electric woks are great aids to your kitchen. Some of the best features of electric woks are non-stick coating, transfer ability, and maintenance of flavors and taste while still locking all nutrients. The electric woks are very versatile and dishwasher safe, so you can sauté, deep fry, and stir fry in the pot.